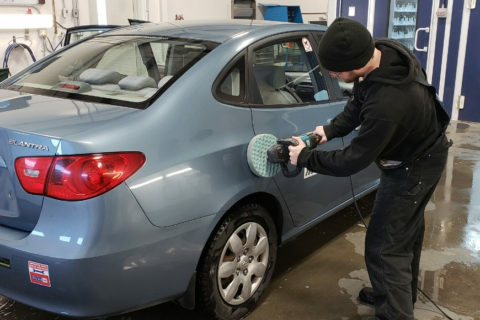 At Neighbourhood Auto Body Collision Center we only use top quality cut polishes and waxes. We offer a number of detailing packages to suit your needs and budget. Prices vary depending on how extensive you’d like us to be. There are a total of 3 stages of cut polishes applied to the vehicle’s exterior finish: course, medium and fine. 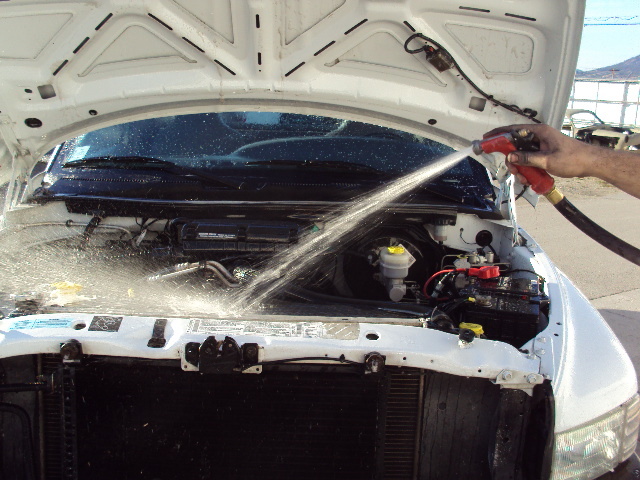 First we start by washing and drying the vehicle and removing any debris such as tree sap, road tar, etc from the vehicle. Then we apply our first application of course cut polish with a 6 inch foam pad attached to a power polisher. This stage of polish will remove all fine scratches in the clear coat, minor rust staining, oxidized paint etc. Once the entire exterior has been gone over we then switch pads to a softer pad and apply the medium polish. This will remove any swirls and any other markings left behind by the course polish. Next we change pads again to an even finer pad and apply an ultra fine polish which gives the polished surface a super high gloss shine. Once complete the entire vehicle is wiped down with a soft dry cloth to remove all polish debris and a coat of heavy paste wax is applied to the entire vehicle. Once the wax has dried it is wiped off with a clean dry cloth revealing and sealing in the best possible finish achievable without repainting. The engine is soaked with heavy duty degreaser and rinsed clean with hot water. First we start by thoroughly vacuuming every square inch of your vehicle’s interior. If carpets are badly soiled we can remove the seats for easier access. Once the carpets are vacuumed we use a high suction extraction machine to soak the soiled areas with a concentrated solution while removing it with the suction attachment all in one fluid motion. Once the carpets are clean we always make sure that they are completely dry before delivering to the customer. This prevents future mildew from growing in the carpet. Many dealerships offer this service when you buy a new car. We can do the same application at a much more competitive price than most new car dealers. *Don’t be swayed by the high pressure sales people, instead give us a call to compare prices before agreeing to any packages at the new car dealer. First we jack up the vehicle and pressure wash the undercarriage to remove all road grime and mud. We then let the vehicle sit over night inside our shop to ensure that everything is completely dry. Then we mask any components that shouldn’t be sprayed such as exhaust and moving parts etc. The entire undercarriage is then sprayed with a thick tar-like substance which will grossly slowdown and in some cases prevent the undercarriage of your vehicle from rusting. It also protects against the elements of the winter Canadian roads. The same goes for this operation as undercoating, many new car dealers will try and up-sell this to you at an enormously over-inflated price. Please check pricing with us before buying your new car. Paint sealant is a high quality, hand applied wax which protects against minor scratches and fading. This is a great product to apply to the exterior finish on a new vehicle. However don’t be fooled by the new car dealers, this is not a permanent finish to your paint and will wash off in time. This product must be re-applied every 6 months or so to keep up its protective layer. Additional detailing services available at competitive rates. Contact us for further enquiries and pricing.